Eric and Lia are two broken persons. Lia recently lost her faith in love when her fiancé got another girl pregnant while Eric is trying to convince himself that he has moved on from the death of his beloved girlfriend, Anna. To prove that he has finally gotten over his loss, Eric recorded his voice in a tape and he intentionally misplaced it as a symbol of letting go. By some twist of fate, Lia was able to get the tape and was instantly moved by the greatness of the voice’s love for the girl. Lia decided to search for the voice to prove that true love is real and it still exists. Unbeknownst to her, the one she is looking for is just living next door – her annoying neighbor, Eric. But just as when they were already getting along, Eric discovers that Lia has his tape. The pain suddenly starts coming back. He tries to convince her that the voice doesn’t exist but ends up falling in love with her. Will Lia ever believe in true love again? Three stories of love, fate and courage come in one film to tell a story of how love touches us in countless ways. 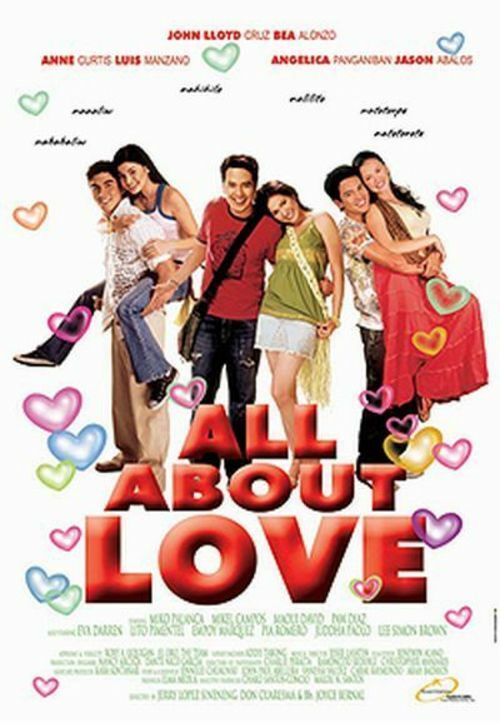 All About Love is a 2006 film released under Star Cinema and directed by 3 of the most popular directors in the Philippines. John Lloyd Cruz won the 2007 Luna Award for Best Actor, handed out by the Film Academy of the Philippines, for his performance in this movie.